As of the end of 2018, the Russian container market has grown by 12% (as estimated by FESCO). Furthermore, export of laden containers has increased by almost 20% and exceeded 1 million TEU. The export growth was explained by supply of lumber to China and steel to Turkey. At year end, the transit increase reached 33.6% (555,781 TEU). At that, transit flows from the Asia-Pacific Region to Uzbekistan through the Far Eastern ports have demonstrated the highest growth rate. Due to import of spare parts through the territory of Russia, this segment has risen by 60%. So far, the forecast for 2019 is discouraging. 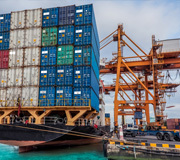 As estimated by SeaNews, container turnover in Russia will lose about 12% in 2019-2020 and the same will amount to 5.18 million TEU at the end of 2019. Approximately 2% of this fall is due to occur in 2019, and the rest 10% will be born by 2020 which will demonstrate the level of 4.67 million TEU. At the Conference we will discuss development prospects and bottlenecks of the container transportation market in Russia, technical issues and status of regulatory environment. highlights of handling flexitanks and tank containers in the RF ports. Special conference topic - container transportation development focused on Central Asia countries and Afghanistan. Participation in the conference will give you a unique opportunity to learn about "know-how" of the latest trends in the container freight market, hear the recommendations of experts, lead analysts and representatives of executive authorities. The main target of our event is to give an exhaustive overview of both theory and practices of container transportation, reconcile international experience and specify the pressing issues of this industry. Registration fee for participation of one (1) delegate is €400.